When looking for a vehicle to add to your collection, or just as a daily driver, we believe that if you can afford the very best car, you should get the very best car. No cutting corners, no excuses. Canepa cars have become renown as being the finest examples of their kind on offer. 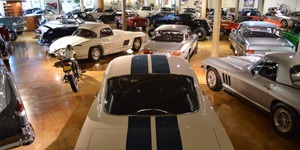 Our years of experience allow us to source only the best cars available, whether remarkably original or fully restored. Once acquired, we then apply The Canepa Difference. This begins with a thorough mechanical and cosmetic inspection; a top-to-bottom service; any restoration to ensure the vehicle is 100%; extensive road testing; and a complete concours quality detail of the engine, chassis, exterior, and interior. Every parts of the car is touched, cleaned and evaluated. Before the car is allowed to leave the building it will have to pass a final inspection by Bruce Canepa, himself. He examines every car down to most finite detail to ensure it worthy to carry the Canepa name. This kind of hands-on, personal approach is one of the many reasons Canepa cars set themselves apart from the competition. Our vehicles have become so well-known for their quality and provenance that people search out Canepa cars in the resale market. Major auction houses make sure they point out our cars in their descriptions. Our attention to detail, and investment in time and energy make a Canepa car a car to be desired. At Canepa we pride ourselves on the in-depth research that we perform on every vehicle that comes into our inventory. We use every tool at our disposal to fully realize a complete history including, but not limited to: examining all the paperwork that came with the vehicle, interviewing previous owners and restoration/repair shops, accessing information available in vehicle registries, reviewing past periodicals, consulting experts in specific marques, and in the case of race cars – interviewing the vehicle's original crew and drivers. The end goal of all of this effort is to provide the most accurate description for our clients, so that they can make an intelligent, informed choice. But even with all of our diligence sometimes descriptions are incorrect or contain omissions. These mistakes may be caused by the faulty memories of individuals, errors in articles or books, or misrepresentation of previous owners. With these elements in play we cannot guarantee the accuracy of the vehicle histories, but do our best to ensure that the facts presented are to the best of our knowledge.